What are Food Systems and why should you care about them? The term "food system" has been mentioned frequently in the traditional and online media lately. But do you know what it means, and why it is important not only for researchers or economists, but for just about anyone who eats? Read on to learn more about food systems and some of the reasons to prefer local food systems over global. A food system includes all of the components and entities required to get food from the farm (or ocean) to your fork including, but not limited to various methods of growing, harvesting, slaughtering, transporting, processing, packaging, purchasing, consuming and waste processing. 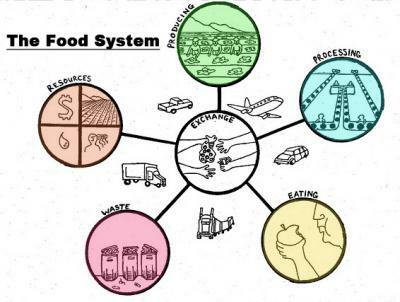 Food systems can be categorized as either global/industrial or sustainable/local/regional. Global systems, often large in scale, usually rely upon industrial agriculture and may prove unsustainable causing detrimental economic, environmental and social impacts on the society. With the invention of refrigeration, the introduction of subsidized fuel costs and the use of effective harvesting methods, foods can now be transported across the world at a very low price for producers. Further, this system relies upon packaging and processing which are often not local to consumers. The local or regional system is geographically localized as opposed to being national or industrial and the food is produced and harvested close to the consumers’ homes, usually on smaller, sustainable family farms and then is distributed over much shorter distances as compared to global systems. The food often goes through less processing, packaging and transporting and many middle men are often cut out. Local food systems utilize two primary markets: direct–to-consumer (including on the farm sales, farmers’ markets, food buying clubs, CSAs, etc.) or direct-to-retail, food service or institution. Consumers, farmers and scholars have varying definitions of the term “local” and often times it is defined in terms of miles (i.e. local food is produced within 100 miles of my home) or in terms of a region (i.e. local food is produced within my state or neighboring states). Regardless of how one defines it, there are several strong reasons to choose local foods. Buying local foods supports farmers allowing them to stay in business and then these thriving farmers can potentially provide jobs to members of the community. Also, money spent locally by consumers tends to stay in the community further stimulating the local economy. Often times, local foods are more sustainably produced; however, this may not always be the case so knowing your farmer and their practices can help in determining if they are producing their food sustainably. In general, though, local foods tend to focus on sustainable practices by avoiding pesticides, using no-till agriculture, composting, reducing transport and reducing packaging. Community health and wellness may be improved because the food may be more nutritious and healthier since it can be picked at the peak of freshness and consumed soon after. Also, food security is improved and hunger is reduced because fresh food is made available to the community. There are many social benefits to choosing local foods. Local foods can help keep culture and tradition alive in the communities by selling traditional, regional foods and this also increases food sovereignty. Many of these local farms provide education to our children (and the community as a whole) by showing them where their food comes from and this can help spur the next generation of farmers as well as help kids value their food and their health. These local systems can build communities and strengthen relationships by offering public events and gatherings. Local food systems provide numerous economic, environmental, health and social benefits to communities. You can find local and delicious foods in your area and start reaping the benefits today by finding a farmer near you! 1000 Ecofarms / Online magazine / Learn and Explore / What are Food Systems and why should you care about them?